A little on starting this week, but very happy about a few things that happened during last week, which I want to share with you guys. Though we had a lot of fun planning what we were to plant in the garden for the fall-winter season, and we almost harvested most of our tomatoes too, the most exciting part was a trip we did to a shop called Daiso, which I had shared about the previous week. So off we go to our cultural adventure. Daiso sells all types of Japanese goodies, and which are very cheap, therefore, you can buy quite a few awesome items. To be honest, we always say it's a lil' dangerous place, because we always want to buy everything! If you like Bento items, this is a great place to get; bento boxes, tools, molds, cute cookie cutters, cups, and other goodies for fun lunch boxes. However, there are really interesting items as well in the areas of; beauty products, house cleaning, gardening, and as mentioned kitchen. However, one of my very favorite sections in this fun store, is the school supplies. For an artist like me, finding brushes, beautiful mechanical pencils, watercolors, among other things, is like getting an early Christmas gift. We got some mats to make sushi, and/or other goodies. We got two garlic utensils to ease the cutting of the cloves. We got an egg that tells you when your boiled eggs are ready and the way you want them to be. We got a plastic-bag sealer, a pair of boiled-egg molds, which are in the bottom. We also got some cute pins for the wall, and a very adorable tiny carver to get super small fruit balls. Plus look at my beautiful new gardening shovel. You can see all of these items in the photo above. In the photo below, you can see all the artsy goodies I got. I have to say, that because I love sketching, my favorite item has to be the floral mechanical pencil. But I am very excited about learning how to watercolor and make some awesome art, plus, the inkstone really allowed me to experiment and create some gray-scaled beautiful doodling as you can see in the photo below. And of course, we couldn't leave Daiso without some yummy chocolates, because; why not? After that fun experience, we went into a grocery store, which sells mostly Asian food. Interestingly, you can find Mexican products in these markets as well. However, the point of our visit was to celebrate that my husband could eat mushrooms again, after batting allergies to the fungus for a while. After a couple of years, it seemed that he was able to get rid of that allergy, and since he was able to enjoy of the yummies once more, we had sort of a mushroom feast. Though I have been a huge fan of these delicious delights for a very long time, I had never really paid attention to who beautiful they are. Not only are mushrooms beautiful, but they are also very delicious in all their edible variations. These were the types of mushrooms that we got to try. I have to say that I really enjoyed them all. Look at this beauty in the picture above! 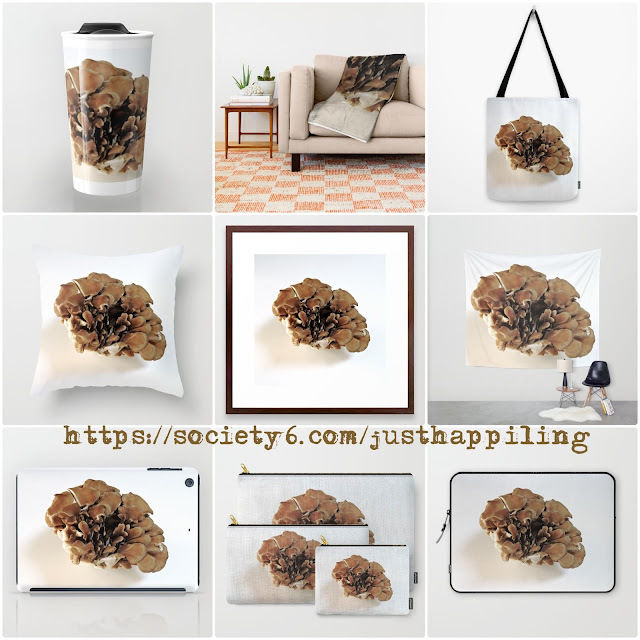 This one is called a Maitake Mushroom, also known as a Hen of the Woods. You don't usually see photos of this mushroom upside down, nonetheless, this mushroom was so beautiful from any angle you saw it, that I decided to take a photo this way. After all, there are a lot of photos of it right side up on google. These are products with the King Mushroom. Don't you just love those beautiful brownish lines. Though I showed you this delight of the woods upside down in a previous photo. 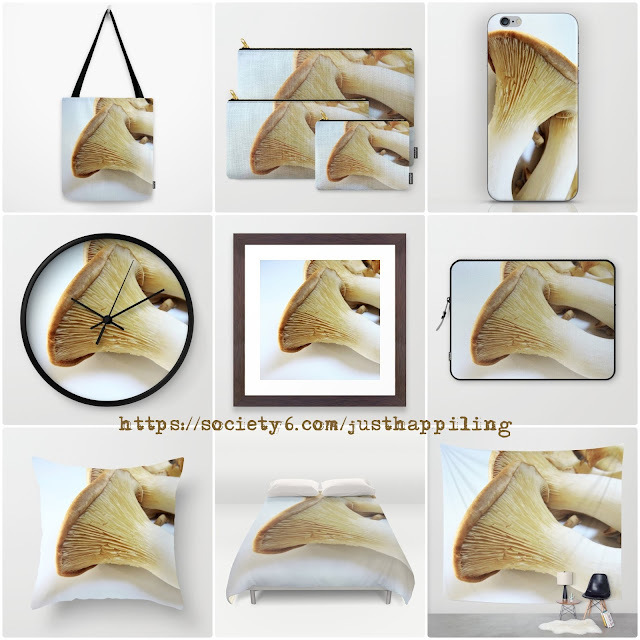 You can see how it looked from above in these really useful and cool society6 products at our shop. 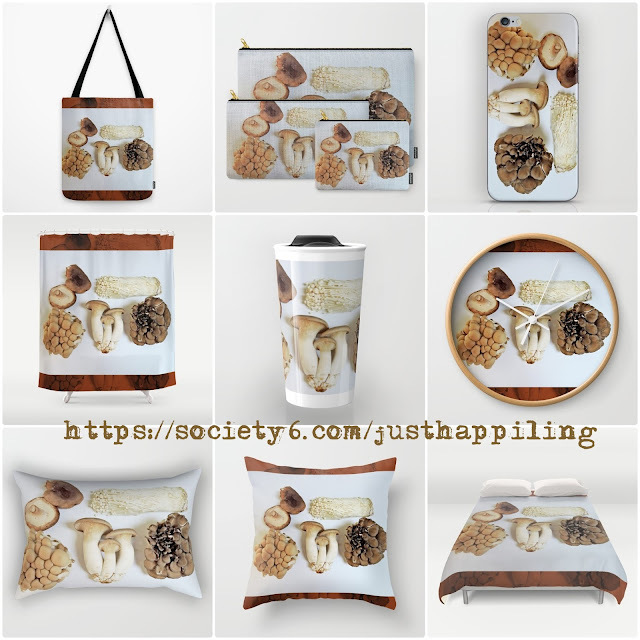 Or if you like them all, I have also added products with all of them, and you can own them too. Just click on the image of the items you want to be taken directly to the print. Choose your favorite, or start checking-off your list of favorite people for the Holidays, which are soon to come. Then to close up with a very adventurous weekend, we stopped by some beautiful Silk Floss Trees, and to our surprise, a hummingbird kept on photobombing my photos. Therefore, I decided just to capture him as well and add the little one to our society6 store as well. And that is all for last week's update and adventure. I hope you enjoyed what we shared, and if you have a Daiso close by, I'd love to know your favorite items there. 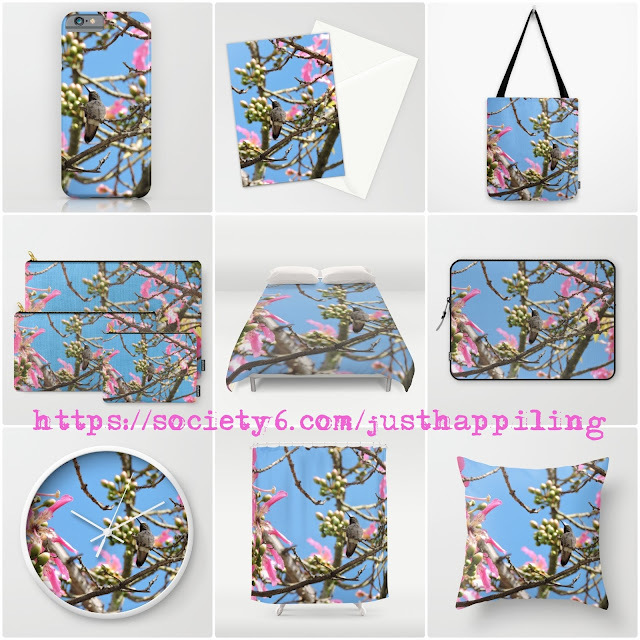 To all of our society6 customers, thank you so much for all your support. We love it when we see you enjoying our products. 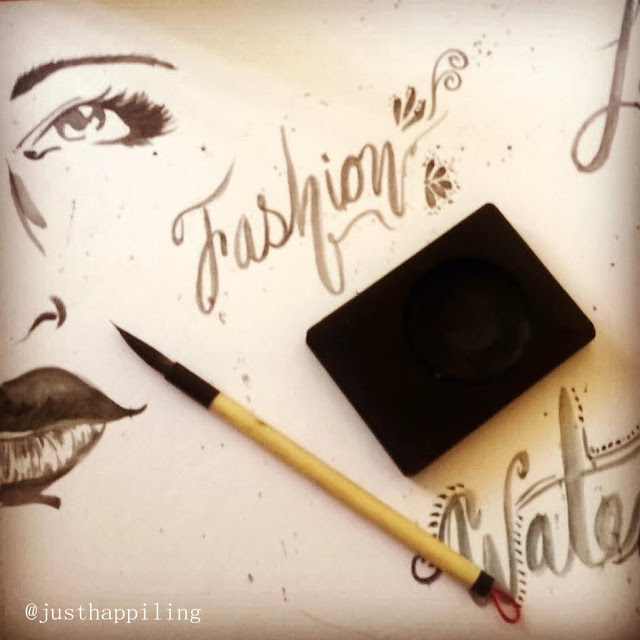 Remember that to keep up-to-date with the latest in our store, you can follow us on Instagram @justhappiling.art or if you just want t follow our blog adventures, you can follow our blog account @justhappiling all throughout social media. That way you can also enter to any giveaways we are hosting or promoting. Talking about which, don't forget to enter for your chance to win a digital HD copy of Marvel's Captain America: Civil War. Giveaway ends tomorrow (Open to US residents who are 18 years or older. Read the terms and conditions before entering. Good luck). Disclaimer: We were not compensated for the purpose of writing this blog post. However, there are links in this post that may lead to our shop from where we may earn an income after a purchase on your behalf. There is also a link towards a sponsored giveaway. All opinions are 100% our own, and all photos used are the property of Just Happiling, unless stated otherwise.